Hey everyone! 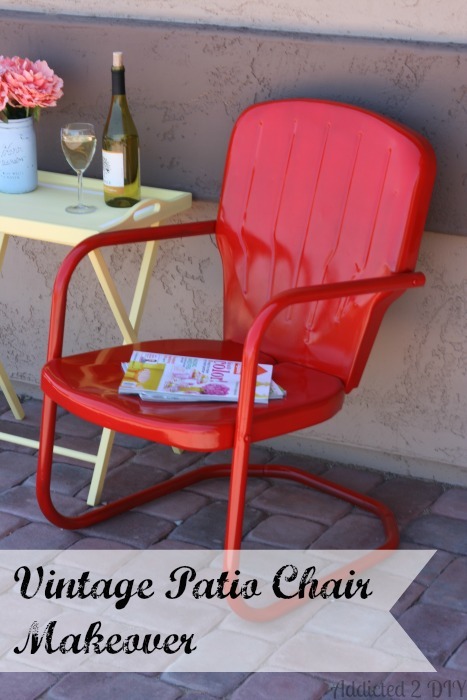 Today I’m going to share with you how I gave a new life to a rusty, forgotten old chair. 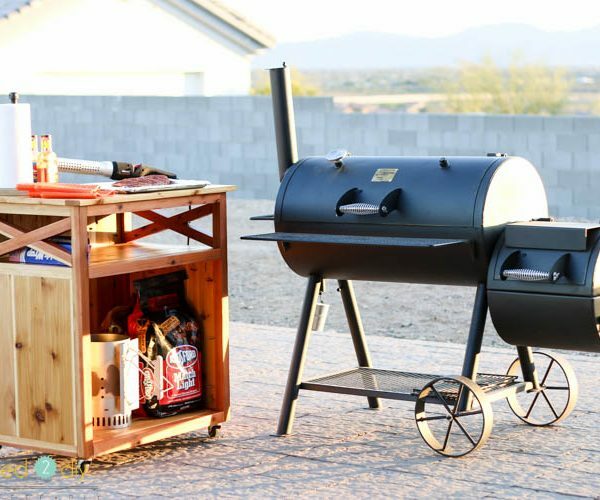 On Monday I shared 10 Inspiring Outdoor Ideas with you all. 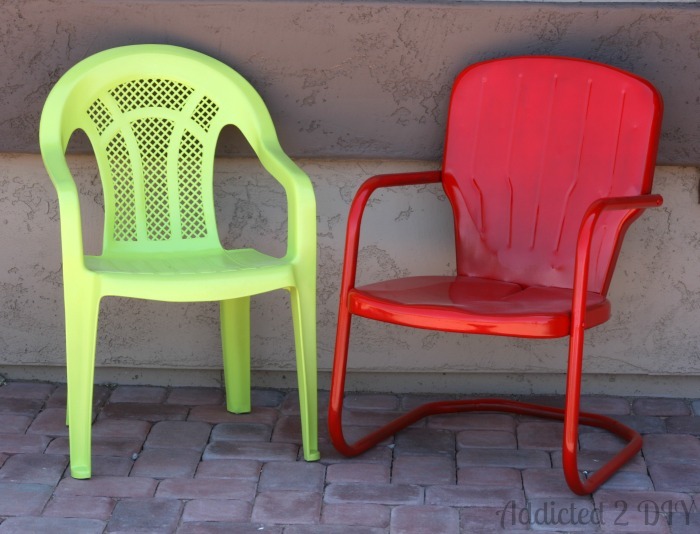 One of those ideas was How to Paint Plastic Outdoor Chairs from Tiny Sidekick. It inspired me to give some sprucing up to an old chair that my mom gave me, plus an old plastic chair we had around the house. I started with the plastic chair first as my spray painting techniques have not always been the greatest. I have been known to leave quite a few drip lines in spray paint, so if this chair didn’t work out I wasn’t going to feel too bad. Prepping the chair was really easy. I just hosed the bird poop and dirt off of it and gave it a bit of a scrub, then set it out to dry. 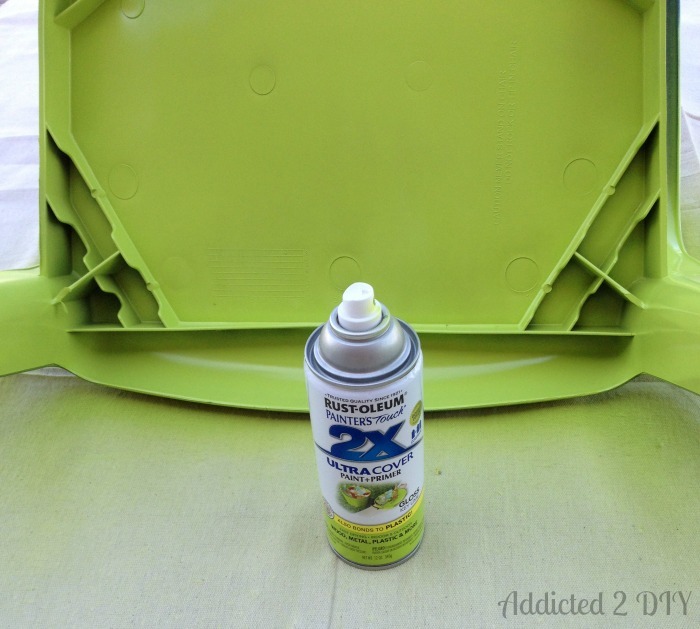 I purchased two cans of Rust-Oleum Painter’s Touch 2X spray paint in this fun key lime color. It pretty much screams spring. I sprayed two coats of paint over the entire chair. I was super proud of myself for not causing any runs in the paint, which built up my confidence to give the old metal chair a new look! This metal chair has been in my family forever. I remember it being on our back porch when I was a little girl. My mom said it belonged to her grandparents. I believe my aunt has this chair’s mate. 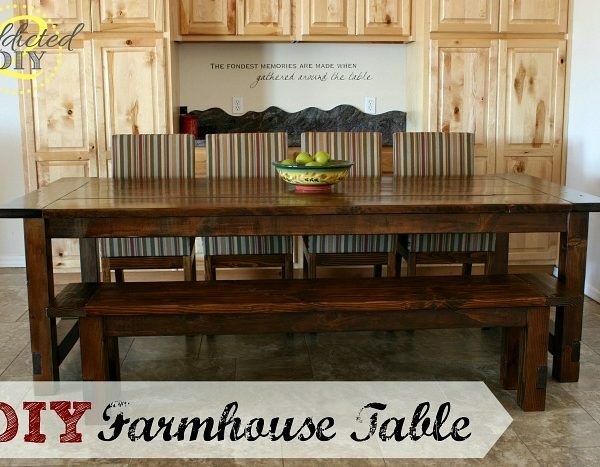 I’ve seen newer versions of these chairs at several places, so I’m guessing this vintage style is making a comeback. 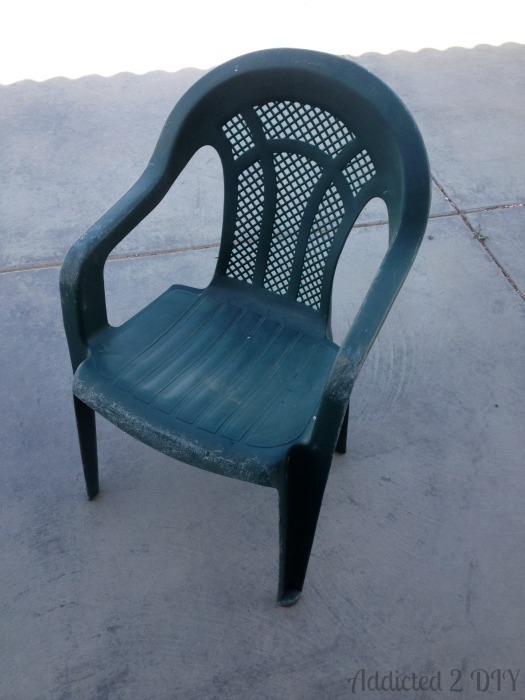 This particular chair has been sitting in the side yard of my mom’s house for 15+ years. It didn’t deserve to die a rusty death, so I decided it was time to make it new again. This chair had been sandblasted and refinished in the past (back in the 80s) after the outlaw of lead-based paint, so I felt comfortable with giving it a light sanding in areas that had a few chips. That being said, I still worked outside and wore a mask. 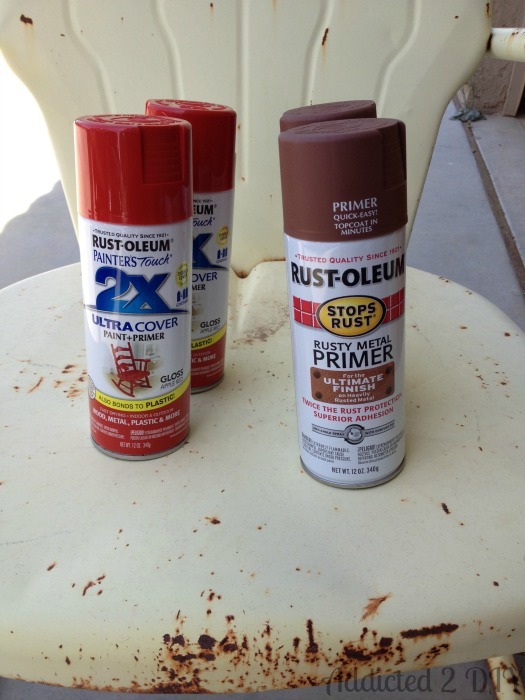 I popped in to my local Home Depot and once again bought Rust-Oleum Painter’s Touch 2X spray paint in Apple Red as well as Rust-Oleum Rusty Metal Primer. 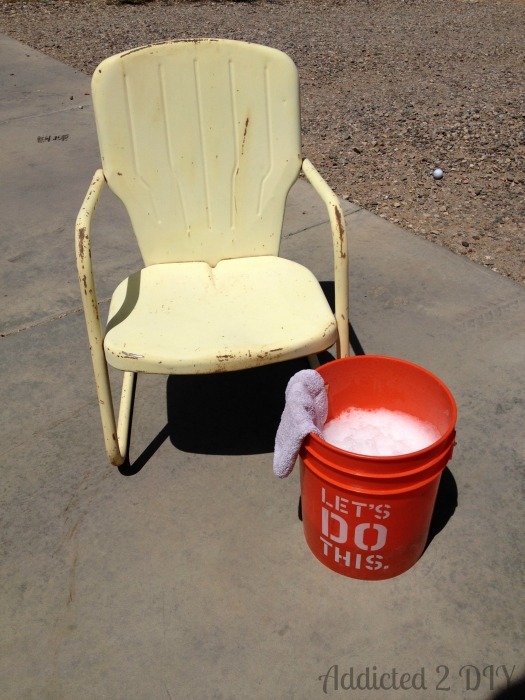 Before I did any painting, I grabbed a bucket of soapy water and wiped the entire chair down. Just like the plastic chair, I hosed it off and let it dry in the sun. Which takes about 5 seconds here. 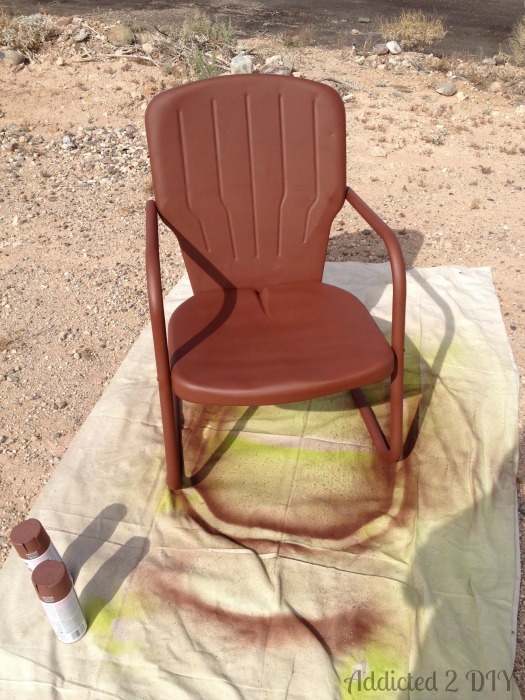 Once the primer was dry, I sprayed the entire chair with three coats of the apple red spray paint. I probably could have done it with two, but the wind started kicking up and the paint wasn’t covering as well. Next time, I’ll be setting up a paint area in the garage. Other than the annoying wind, I loved the coverage of this paint. I was also doing a happy dance for completing my first spray painting project that didn’t have any drip lines! It’s the little things that get me excited. 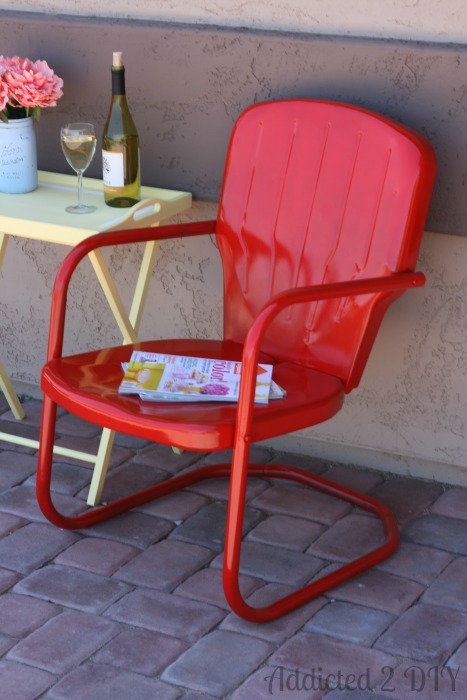 I am so loving the bright cheerful color of this chair. I’m looking forward to many evenings in it with a glass of wine and a magazine while watching my boys play. Now that I’ve had two successful projects that didn’t look like a 5 year old was turned loose with a paint can, I’m ready to tackle more projects! I can’t wait to get to work on them. If this stupid wind would ever calm down. My weather app says it’s 20mph winds, but I’m calling shenanigans on that one. Do you have some spray painting triumphs or horror stories? I’d love to hear them! I love the colors! We actually looked for some of those metal chairs for our old house patio. They are so great! And that plastic chair had quite a transformation. I think everyone has some faded chairs like that and I honestly had never thought of painting them. Way to go with the drip free painting. Thanks! I was so excited when I didn’t have drips! I thought of your mad spray painting skills while I was doing it! I love vintage chairs like these! They look so good – I wish I could find some in my area. Thanks! I may hint to my aunt that I need the mate for this chair;) Two would be awesome to have. Your chairs turned out great. I can’t believe you got such a good finish with the wind blowing. I usually end up with a bug stuck on my stuff when I try to spray it outside. So annoying. But I have a metal glider kind of like your chair that I have been wanting to refinish. After seeing your results, I’ll definitely try it. I bet your glider would look amazing! So Rust-Oleum Painter’s Touch 2X cover plastic and stay without peeling? I know Kyrlon makes one for plastic but didn’t know Rust-oleum did too. So far so good! If you look at the post I referenced from Tiny Sidekick, she said her plastic chairs are going strong after a whole year. She used the same paint. The can does say it works well on plastic. Thanks for stopping by! Thank you! That’s awesome to hear! Wow Katie! That red is amazing. Spray paint is seriously my best friend! Thanks for the shout out! Thanks for the inspiration, Corey! Katie, these turned out so well! I’ve been looking for some vintage metal chairs like these. I feel your pain on the crazy wind. Keep up the great work! Thank you Erin! It’s been even worse this week. I’m hoping that it will calm down at some point so I can get to work on some other projects! Wow!! Just what I’ve been looking for! I have 2 of those chairs plus the little round table that matches them in my garage. They also have some rust issues and need some sanding over rough spots. They belonged to my grandparents and they had them forever! I’m now 64. So I’m headed to HD to buy some of that rust stopper stuff and red rustoleum paint! Love your website!! ideas for a metal patio chair with no seat? 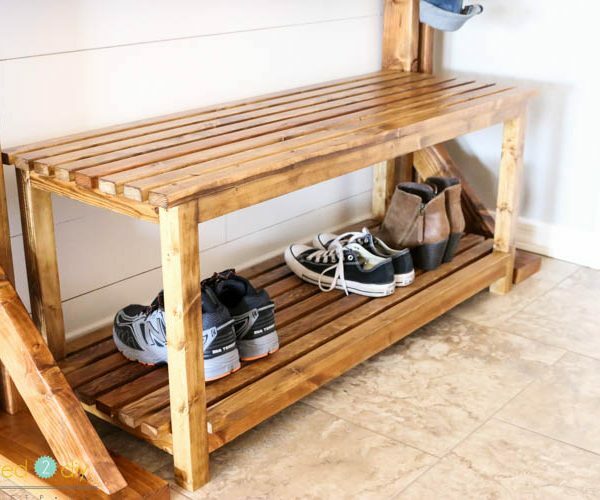 Maybe make a wood seat? Thanks Katie! Yes, the rust spray paint was new to me too, but it works great! 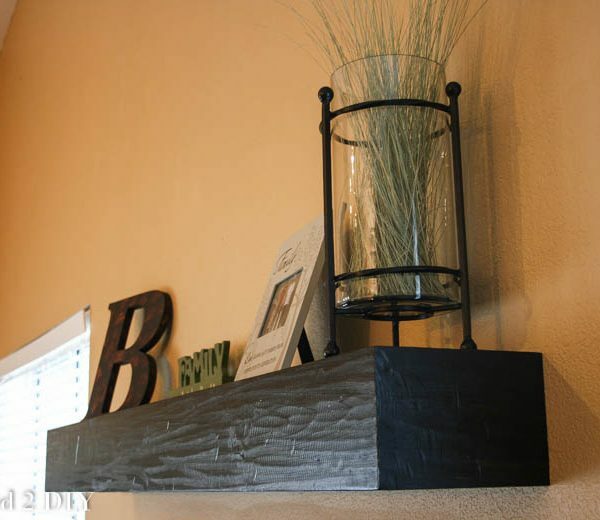 I do believe that Rust-Oleum has a clear coat that you can use. I’ve never tried it myself, so I can’t give you any opinions on how it would turn out. Also, don’t be so preoccupied about the appearance of the chair. It has a job to do and purpose, to provide coziness and comfort. Just like singing, even if you are the world’s second worst, (I am the worst) sing and stimulate your baby’s verbal development and enjoy the closeness. One day your child will tell you when to stop singing, so enjoy it while you can. Every stage goes by incredibly fast. How cool! So glad everyone loves it! I am currently restoring a patio set with couch/chairs/ table. Torn between a satin black or a gloss black. I am leaning towards a gloss black..what are your thoughts? I love the red chair..adorable. not sure how that link got put in..not intentional..
Did you strip off the old paint first and if so what did you use? No, I sanded down any areas where the paint was chipping, but I left the rest on and covered it with the rust prevention spray first. Turned out beautiful and now I’m even more excited to paint the one lonely metal chair i have in a really pretty lavender. Thanks for inspiring me.